Psychic Geographies is a tour de force, an ambitious exploration of the age, its physical and emotional permutations, its tragic contradictions, its joyful transformations. Gregory Betts takes a construct from the Situationists of the last Century as a means of exploring the language and rhetoric of the contemporary global moment as symptomatic of stasis and psychosis. 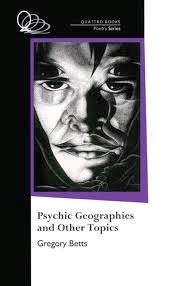 How he does this is what sets Psychic Geographies apart, what makes this a book without precedent in Canadian letters.